Are plants and garden tools cheaper at Aldi and Lidl? If you love a bargain, you’ve probably visited Aldi and Lidl stores and seen plants loaded up on trollies outside the store and might even have seen gardening tools inside. But are they any good and any cheaper than what’s on offer at DIY stores and garden centres? We wanted to find out whether the plants would thrive and the tools were robust enough to stand heavy use in the garden, so we bought a wide range of gardening special buys throughout 2016. We bought similar products from a range of other garden retailers, including DIY stores B&Q and Homebase, discount retailers Wilko and Poundland, and a range of garden centres. 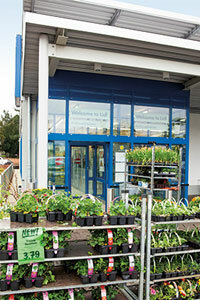 We found a huge range of plants on sale in Aldi and Lidl – from seeds to fruit trees – and bought these alongside bulbs, shrubs, climbers, seed potatoes, bedding plants and a wide variety of perennial plants. Overall, we thought these offered good value for money. We were impressed by the cheap clematis and honeysuckle plants, and some of the perennials sold in small pots grew quickly and gave us a good show of colour. Bedding plants flowered just as well as those we bought from garden centres, but were much cheaper. Potted bulbs were great value, and Lidl has these on offer from today. We also liked the mixed boxes of summer-flowering bulbs, sold by Aldi. However it’s worth spending a bit more on some specialist varieties of bulbs. We bought acidanthera from Lidl, Poundland and a local garden centre, but the only ones to flower were the much larger bulbs we bought from specialist bulb supplier Avon Bulbs. However, some plants weren’t so wonderful. We thinkthat you’re better off buying fruit trees from a specialist supplier or a good garden centre, and it’s worth shopping around for larger shrubs and buying the best variety for your garden. Click on the links above to find out what we thought of them. Every gardener needs an regular supply of pots, fertiliser, plant ties, gloves and cloches. We bought a wide range of items and found them good value for money compared with similar products from other retailers. Hand tools were very low cost, but robust and well built, and we were impressed with trowels, hand forks, secateurs and loppers. There were a few things we particularly liked, including a pop-up bin from Lidl and a seed and cuttings tray from Aldi. Some of the cloches were great, too, although others were a little flimsy. However, we think it’s worth having a close look at the products on offer, to see whether they’re as good as they might be. We found module trays with no drainage holes, and propagation trays with no inserts. We also think Aldi and Lidl could do much better with their compost. If you buy a poor compost, your seeds and plants will not thrive, so it’s always worth checking out our Best Buy composts. Read our advice on gardening through the year.